05 | August | 2011 | Oh Look, Krill! I actually discovered this a week before Ramadan, while I was searching for a light lunch at work. It just so happened that I dropped by the tiny cafe near the office and they had this. It’s so easy and I just had to share. Toast the bread to the desired level of toasty-ness. Any kind of sliced bread will do, I prefer wholemeal or multi-grain. 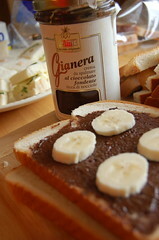 Spread the Nutella all over both slices of toast. Be generous. Slice the banana into 1/3 inch thick and arrange it on to a slice of Nutella covered toast. Slap on the other piece of toast. Cut the sandwich diagonally across and serve. TA DA! A quick, semi-healthy sandwich that’s perfect for any time of the day or night. I’m itching to try it with peanut butter instead of Nutella. Categories: Friday Foods | Permalink.